Hairaway Canada - What is the story? The last thing you want to be doing before an important meeting or romantic dinner is remove unwanted hair. And if - like most women and even an increasing number of men - you have sampled every possible hair removal product on the market and are still unsatisfied, then it is time to consider the solution at Hairaway Canada in their medical laser hair removal clinic situated in the beautiful serene village of +Unionville. Hairaway Canada is highly specialised in the field of medical laser hair removal. In fact, hair removal is all we do! Unlike beauty salons and other spas that offer a range of additional services, Hairaway Canada dedicates time and expertise to the one thing we do best - the elimination of hair producing cells with the use of the most advanced and powerful medical lasers available in the market today. And why? Because we know you do not want to compromise on quality. After all, you would not see a doctor if you had problem with your teeth - you would consult a dental specialist. So why go to a beauty salon or a spa, when it makes sense to go straight to the hair removal experts? Hairaway Canada offers a medically proven solution. One of the secrets to our hair removal is the proven powerful medical lasers employed at our hair removal clinic in Markham. These systems are revolutionary and come with patented technology offering the most rapid and effective hair removal solution in today's market. This powerful state of the art system has been developed through scientific studies at the Wellmann laboratories, a leading US medical research facility and is approved under FDA, Canadian, European and Australian regulations. These systems used by Hairaway Canada at their hair removal clinic in Markham treats hundreds of hair follicles at one time, using an infra-red light at a wavelength proven far more effective and yielding much faster results than the pulsed light systems normally used at beauty salons and other non specialist centres. WHY GO TO A BEAUTY SALON WHEN IT MAKES SENSE TO GO STRAIGHT TO THE HAIR REMOVAL EXPERTS AT HAIRAWAY CANADA. Hairaway Canada's other secret is our skill. From the initial free consultation to reliable post-treatment care, Hairaway Canada's highly trained and very experienced team invests the time to assess your individual suitability for treatment, providing the best professional advice available. With over 60,000 treatments under their belt, you can be assured of the best at all times. Hairaway Canada makes your safety our priority - not your money! So if you are not deemed to be a suitable candidate, we will inform you at the time of your consultation and advise you precisely as to the reasons why we are unable to help you so you can be sure not to fall into the trap of empty promises from other service providers. Our pricing structure is completely transparent with no hidden charges, compulsory programmes, forced sales, hard-sell tactics or empty promises. That is simply not our style. Come to Hairaway Canada for your hair removal needs. You will be in the best possible hands and will have nothing to lose but your unwanted hair. 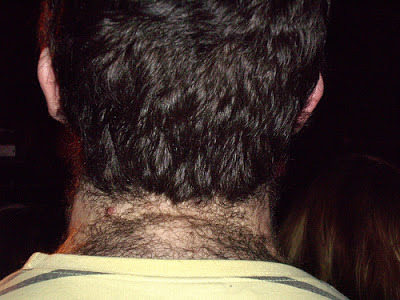 Neck hair and removal methods for men. What solution is the best? Hairaway Canada provides the answer. Over the weekend, the writer of this blog, was at a men's hair salon in the beautiful village of Unionville here in Markham. It was a busy period. Both for the village which was in the midst of its annual street festival and also for the salon being full of patrons, either like the writer, having a periodic hair cut and or a shave; either to their faces or the back of their neck - as a means of tidying up the messy look and often embarrasment the hair on the back of the neck can create for some men. At a time when medical lasers for hair removal were simply a figment of the imagination, men had to resort to having the excess hair on the back of their necks, either clipped or often shaved and this latter methodology of removing hair was a temporary yet effective means of providing that 'clean' look. The only problem with shaving the hair on the back of the neck is that the shaving process results in the hairs becoming much coarser and much less manageable with the only solution being additional shaving which in turn creates a bigger problem. The cycle continues, ad infinitum, ad nauseam with repeated visits to the barber necessary to have this hair removed from the back of the neck. Because if left alone, it creates the following look, which in all honesty, is not a pleasant look. At its hair removal clinic in the beautiful village of Unionville, Hairaway Canada uses the most advanced medical lasers to eliminate the hair producing cells in the back of the neck area so that its clients need not worry about an unkempt, messy and untidy look or be required to go for repeated visits to the barber to have the area shaved. One treatment with the use of the medical lasers at Hairaway Canadas' hair removal clinic in Markham, results in the elimination of up to 30% of the hair producing cells. And, depending on the skin and hair type of the prospective client, to achieve a clearance of the hair from the neck, four to six treatments, interspersed over a period of six to eight months, is more than sufficient. We would encourage all men to give consideration to having the hair on the back of their necks removed with the use of the most advanced medical lasers at Hairaway Canadas' hair removal clinic in Markham. You have nothing to loose expect that bothersome, untidy excess hair.